The ViewSonic PX727-4K leads the industry in the race for affordable 4K projection. 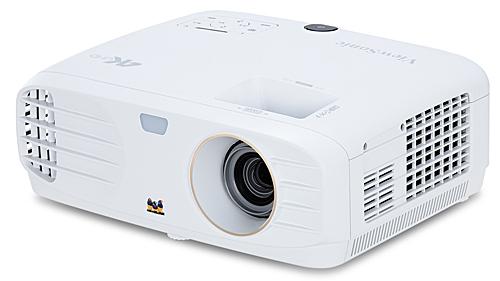 At just $1299 it is currently the least expensive of the new 4K projectors featuring the latest 0.47" UHD DLP chipset. And if you are like me, you automatically suspect that lower price means lower quality. Not so in this case. The ViewSonic PX727-4K is the finest home theater projector ViewSonic has ever made, and it competes very strongly against the other 4K models priced at $1499. ViewSonic has invested a lot of development effort into color optimization in its home theater projectors over the last several years. The result is often very nicely balanced color right out of the box that requires little calibration. But with the PX727-4K they have taken color optimization a step further with the internal development of a proprietary RGBRGB color wheel with Rec. 2020 compatibility. We don't know the precise technical differences between this wheel and the RGBRGB wheels in other projectors, but the end result is that color definition on the screen is outstanding. At the current price of $1299 the ViewSonic PX727-4K competes most directly with the Optoma UHD50, the Vivitek HK2288, and the BenQ HT2550, all of which are currently priced at $1499. Brightness. The Viewsonic PX727 is rated at 2200 lumens. As is typical, this projector has a very bright factory calibration, called "Bright." The brightest modes on most projectors tend to be skewed toward an obvious green. However, the PX727-4K is cyan in bias and not as heavily tinted as the competition. In fact, if you put the PX727-4K up side-by-side against the three competing models noted above, put them all into their "Bright" modes and display a 100 IRE white test image, the others all look obviously green while the PX727 looks neutral white in comparison--the perception of cyan disappears completely. This of course is your brain playing tricks on you, but it demonstrates how infinitely flexible the brain is in interpreting relative color differences. In the end, you still wouldn't want to use the PX727-4K's Bright mode in situations where color accuracy is of primary importance, but for a football party in ambient light you can get away with displaying the big game in Bright mode without it looking too excessively green. The PX727-4K also has presets called Standard and Movie that are not as bright but better color balanced than Bright, along with two custom adjustable User modes. Standard shows a much more subtle cyan bias than does Bright. Meanwhile, Movie is essentially neutral--the "go to" mode for ideal movie/video display. In Standard mode, the brighter of the two, color brightness measures 81% of white. In Movie mode, color brightness measured 106% of white and gives you the most balanced picture the PX727-4K is capable of. There is an Eco lamp mode which reduces the Movie and Standard mode brightness by 34% and Bright mode by 37%. The PX727-4K also has an energy-efficient dynamic black mode which is referred to as SuperEco in the marketing literature but appears as Dynamic in the menu. This option extends lamp life to 15,000 hours. It does not reduce the luminance of the 100 IRE screen used to take ANSI lumen measurements. Zoom lens light loss. The PX727-4K has a 1.2x zoom lens that loses a paltry 3% at the telephoto end compared to the wide angle end, so there is no reason to worry about which end of the zoom you're using. Picture Quality. In addition to impressive color quality, the PX727-4K hits on all cylinders in terms of image sharpness edge to edge, image clarity and stability, minimal noise, and excellent contrast that produces good image depth (three-dimensionality). The Super Resolution feature typically defaults to a low setting and lends beautiful incremental detail definition. The only downside to a low Super Resolution setting is that it will accentuate digital noise in scenes where there is already a lot of noise in the source (for example, the interrogation scene at the beginning of Blade Runner). But since the vast majority of 4K material lacks this level of noise, most users will prefer the extra sharpness of detail rendered by the Super Resolution detail processing when activated on low settings. The picture is remarkably stable with noticeably reduced judder in motion/panning sequences compared to competing units, particularly with 1080p sources. It also has a smooth, natural film-like quality that the competing units cannot always match. It is almost as if there is some frame interpolation going on, but there is not. Black levels are adequate, incrementally better than the BenQ HT2550, but they do not reach the depth of black that one sees on the Optoma UHD50. This is mostly noticeable in a side by side comparison when images with black backgrounds such as rolling credits or the FBI warning screen are being displayed. On the other hand, in scenes with average illumination levels and continuous gradations of luminance from black to white, the PX727 tends to render black elements as solid black. And it can deliver contrast and three dimensionality that often exceeds the UHD50. So one must be careful not to confuse maximum achievable black levels with overall image contrast. HDR Picture Quality. On all of these 4K projectors under $2000, the HDR picture is an incrementally higher contrast image than you get with non-HDR sources. So it is an appealing feature, and combined with the 4K resolution of the HDR sources they deliver an outstanding viewing experience for the money. None of these lower priced models match the dynamic range of the more expensive home theater projectors from Epson, JVC, or Sony. And none of them (thankfully) replicate the extreme HDR pictures seen on flat panel TVs, which tend to look supersaturated, digitally over-manipulated, and basically fake. The HDR on the PX727-4K is highly competitive with the other 4K offerings under $2000. Like the non-HDR display it is sharp and exceptionally smooth and natural. What you get on the PX727-4K is an attractive high contrast HDR image that looks naturally balanced and not overprocessed. Due to the non-standardized output levels in HDR source signals, we see variations in color balance, color saturation, and ideal brightness/contrast settings from disc to disc. Each projector tends to interpret these a bit differently, and there is no such thing as an ideal HDR calibration that displays all HDR sources optimally. So the PX727-4K, like all projectors, typically benefits from a few tweaks to the basic contrast, brightness, and saturation controls to accommodate each individual disc. Those with more experience may also want to play with color gain and offset--the movie Lucy for example, is displayed with a slight greenish hue that can be neutralized by bumping the red and blue gain controls up a notch or two, and green down a few. Brightness Uniformity. The PX727-4K measured 78% at the telephoto end of the zoom and 76% at the wide angle end. There is no visible hot spotting or fading when viewing a 100 IRE white test screen. The image is brightest at the bottom center and gradually decreases toward the upper corners, but the shift is so gradual as to require a meter to detect it. Input Lag: The PX727-4K measured 53 ms input lag. This is fine for most casual gaming, but serious or professional gamers will probably want a faster unit. Many ViewSonic projectors measure a rapid 16 ms, although they are not as elegant as the PX727-4K, so in this case gamers are faced with a trade-off of picture quality vs. gaming speed. HDMI Port Bandwidth. One of the two HDMI ports on the PX727 is HDMI 2.0 with HDCP 2.2 to accommodate native 4K playback, and has a bandwidth of 18 Gbps. Rainbow artifacts. Rainbows are very low on most DLP home theater projectors these days, including the P727-4K. However some people are uniquely sensitive to this artifact, and there is no way to predict whether you may be one of them. If you are uncertain, buy from a reseller with a friendly return policy so you can test it out yourself. Fan noise. The fan noise is audible in Normal (full) lamp mode, but not excessive or objectionable in our opinion. Dropping the unit into Eco mode will reduce fan noise to just a low buzz that you can detect in a silent room. In High Altitude mode, which is required at 1500 meters elevation, fan noise in Normal and Dynamic (SuperEco) is high enough that you'd want to position the projector as far from the seats as possible. Users may want to opt for Eco mode, which drops fan noise at High Altitude to a level that is easy to live with. On board Audio. The PX727 has a single 10W speaker mounted on the side. It is enough to give you a basic sound track, but it is thin and not particularly loud. The superb large screen experience you get from the PX727 is best enjoyed with a full surround sound system, or at the absolute minimum a high quality sound bar. Lamp Life and Replacement Cost. ViewSonic is quoting 4000 hours of lamp life in Full lamp mode, and 15000 hours in SmartEco mode. A replacement lamp is $149. Warranty. The ViewSonic PX727-4K comes standard with a 3-year warranty. The PX727-4K throws an image at a fixed upward throw angle such that the bottom edge of the projected image is a couple of inches above the centerline of the lens. There is no lens shift, so take care to install the projector as precisely as possible relative to the screen. This projector has a 1.2x zoom lens that will throw a 120" 16:9 image from a distance of about 13' to 15'8". If you have your seats about 1.25x the screen width (a comfortable viewing distance for many people), they would be positioned about 11 feet from the screen. So the projector would be positioned just behind the seating area. To check the throw distance required for your desired screen size, see the ViewSonic PX727-4K Projection Calculator. Dark frame around image. All of the new 4K projectors using the 0.47" DLP chipset throw a very dark but not perfectly black frame around the projected image. The frame is about 4.5% of the picture width. So for a 120" diagonal image (105" in width), the projected dark frame is almost 5" wide around the entire active area of the 16:9 image. If you are projecting onto a screen with a black 3" wide frame, a bit of the projected dark frame will fall onto the wall around the screen. If the wall is white and you are in a dark viewing room this may be visible. No 3D. To the dismay of 3D fans, many of the new lower priced 4K projectors lack 3D capability, and this is one of them. If you are budgeting below $2000, your 3D + 4K options at the moment are the BenQ HT2550 at $1499 and the Epson Home Cinema 4000 at $1799. Those are two radically different home theater projectors, each with their own set of advantages. Weak onboard audio. Though sporting a 10W speaker, the audio is thin and not very loud compared to competing units with 5W speakers. If you need it for portable use, it is functional but not impressive. On the other hand, most premium home theater projectors have no audio at all since they are expected to be used with surround sound systems, so feel free to ignore the audio on this unit. 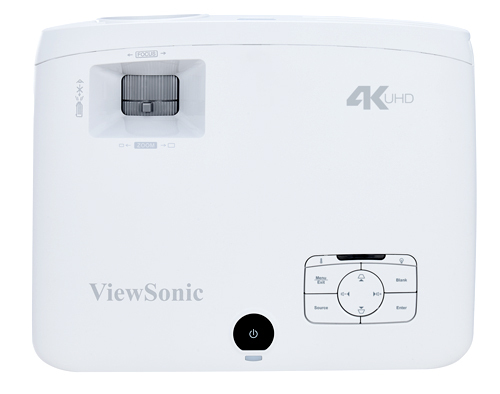 Of all the 4K projectors that have come out recently under $2000, the ViewSonic PX727-4K is the most surprising. One naturally assumes that the sticker price of $1299, the lowest of the 4K models, is meant to suggest a value-priced alternative that does not perform quite as well as the higher priced units. Nothing could be further from the truth. The PX727-4K is in many respects the most elegant of this new group of 4K projectors when all aspects of picture quality are taken together as a whole--image sharpness, color balance, contrast, saturation, image stability, and a natural smoothness that will appeal to the videophile. It does not have the black levels of the Optoma UH50, the UHD60, or the Vivitek HK2288, nor does it have the 3D of the BenQ HT2550, but in many other important aspects it can exceed the performance of these more expensive competitors, each of which has flaws of their own. In the end, the ViewSonic PX727-4K is simply a lot of fun and a true pleasure to work with and explore. We are looking forward to spending a lot more time with it. For the money it is an outstanding value, and we are happy to give it our rare Editor's Choice Award. Thanks for getting all of these reviews posted Evan. Really seems that Viewsonic has made a strong come back to the projector market. Their features, aggressive pricing, and 3 year warranties make them a solid option in nearly every product category. Looking forward to what they come up with next. Looking forward to the comparison between all of these budget 4k projectors. Please include the Epson Home Cinema 4000 as it's around this price range as well and seems to have the lowest input lag of the bunch! Thank you. Impressive except for the lack of lens shift. Does anyone know what the extra cost is to manufacture with lens shift. I see that feature as a must have. Is this projector's aspect ratio 16:9? Louie, yes, all of the projectors using the 4K UHD DLP chips put a pixel matrix of 3840x2160 on the screen, which is a 16:9 format. How does the ViewSonic PX747-4K compare to the 727? Any other features beside more lumens? Randy, the only physical difference between the PX727 and PX747 is the color wheel, which allows higher lumens on the 747. "15000 hours in SmartEco mode" It's practically as good as LED. After years of research and most importantly "waiting", i decided to buy this one, ditching my 120" 3d home cinema dreams regarding the reviews. And i dont regret it, not even a tiny bit. It performs very good right out of the box even on a rough and weird coloured wall (95-120"). But when my 120" contrast gray (black background ofc!) screen arrived, everything changed. My room faces the sunset with a 3+ meters wide glass door, so it is impossible to watch anything during the sunset, but it handles normal ambient light almost perfect and daylight to some degree. Try to limit your adjustments to "moviepro" and "EOTF" under the HDR menu. most of the time you will need to leave eotf in low mode, since the rest creates washed out images and horrific giant pixelated dark screens, especially on 4k images. Playing around with color enhancement, its a pretty straightforward process. depending on your preference, the higher you go, the more vivid the colours become (in my case, for the better). I left it around 10ish but you could lower it to cool the image a bit. It doesnt affect the sharpness of the image or the action scenes negatively. Super resolution function is a bit tricky. It has no constant other than one and that is "dont go above 3-4 if you are watching 4k content". The story changes when you try to watch 1080p and below. sometimes you can increase it further, sometimes you might wanna consider pushing it down to "0". the same story goes for eotf function. Also dont get disheartened by its 50+ ms input lag. I have tried various games and all performed well. I am using a professional gaming mouse and i couldnt notice the lag with my bare eyes. Ofc never tried competitive gaming, but its not a thing any competitive gamer would do on any projector anyway so i dont see any reason to put this in the "cons" part of my experience. the only con i would mention would be the menu behaviour (rarely it quits from the menu after you do your adjustment) and the turning on process. Seemed to be a tad slower when compared to my father's own dell 3300mp projector (which is like 13-14 years old). But it takes longer to set up the screen, the movie, the game anyway so again its not a biggie. Rainbow effect? I personally only see those when the movie is about to start and there is a completely black screen. any bright tiny image on the screen, and rainbow disappears for me. even when its there, it doesnt bother me at all. Its just there. Do you know the bandwidth of this projector's HDMI ports ? I wouldnt recommend this for pc gaming as it only does 30hz maximum at 1440p. It will do 60hz at 4k and 60hz at 1080p but for some odd reason only 30hz at 1440p. Just spent the last few days trying to get it to display 60hz at 1440p. Its not mentioned in the tech sheet/description or in the manual at all. And unfortunately in pc gaming the difference between 30hz and 60hz is night and day. Very laggy response at 30hz. I just purchased this PX727 model and it is going in a dedicated theater room just for movies. I'm going to paint the room in a flat chocolate brown tone and there are no windows. Would you recommend me a grey screen or a white screen? Thanks for your help. White screen. You don't need the contrast boost that might come from a gray screen and a matte white screen will give you better image texture (ie smoothness) with no artifacts and more accurate color. Hi guys, I can confirm that this is a great looking and super sharp 4K projector. I was wondering if anyone here knows the way to access the service menu on the 727. Or other Viewsonic projectors which might work. I want to dig deep. Thanks for any help / tips you can offer, greatly appreciated.